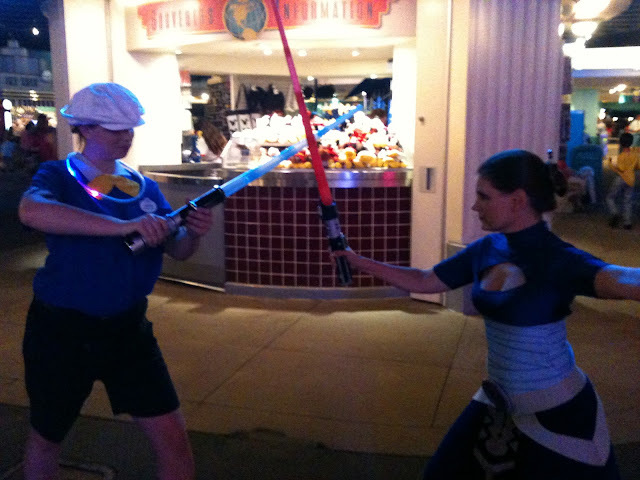 Disney cast member duels with Sorcerer Radio's Kristen Hoetzel during Star Wars Weekends. Photo by Aljon Go. Star Wars Weekends, the Force-filled, fun-fest that takes place annually at Disney’s Hollywood Studios, returns to the Walt Disney World Resort galaxy every Friday, Saturday and Sunday from May 17-June 9, 2013. A celebration of all-things-Star Wars, the special event is included in regular park admission to Disney’s Hollywood Studios. Among the features: a special Star Wars-themed parade, appearances by Star Wars celebrities, special additions to Jedi Training Academy, a Star Wars-themed talk show, behind-the-scenes presentations, limited-edition merchandise, a nightly celebration and more. The centerpiece of the celebration is Star Tours: The Adventures Continue, the immersive 3-D attraction that speeds guests through worlds featured in the Star Wars saga. Also showcased at the event: the largest collection of official Star Wars characters gathered at any theme park in the world, roaming the areas and posing for meet-and-greet opportunities in front of themed scenery. Be sure to check back with JediMouseketeer.com for coverage of this year's Star Wars Weekends for the Sorcerer Radio Network!